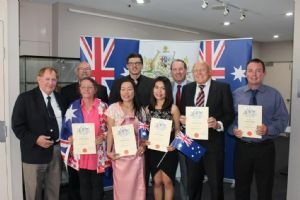 The Bega Valley Shire’s newest Australian citizens were welcomed this week with an official citizenship ceremony held at the Council chambers in Bega. Mayor Michael Britten and the Federal Member for Eden Monaro, Dr Peter Hendy, welcomed seven new Australians living locally in the Shire. “These new citizens have undertaken a journey much greater than most of us appreciate, in some cases several years with a will to become 'Australians', and we congratulate them,” Cr Britten said. The new citizens are Tamer Ahmed of Eden who was born in the Russian Federation; mother and daughter Sommai Harris and Supichaya Luanmongkol of Bega (Thailand); Pauline Rees of Berrambool, (Scotland); Chris Smeda of Bermagui (South Africa); Lawrence Verney of Merimbula (United Kingdom); and Wayne Armstrong of Eden (Wales). Photograph: (Back row, from left) Mayor Michael Britten with Lawrence Verney, Tamer Ahmed, Member for Eden Monaro Peter Hendy, Chris Smeda, Wayne Armstrong and (front) Pauline Rees, Sommai Harris and Supichaiya Luanmongkol at a citizenship ceremony in Bega this week.